NCSC can be reached during normal business hours. Send us your questions and comments. We want your input, and we want you to be as informed as possible. Northern California Safety Consortium, is located in McKinleyville, CA, on the Redwood Coast. 1932 Central Ave., McKinleyville, California Cross street Heartwood Dr. in the McKinleyville Plaza located in the northwest corner of the intersection. Traveling North from Eureka and other points south, take Hwy. 101 N. to the first McKinleyville off ramp (Central Ave.) which will drop you onto Central Ave. Continue north on Central Ave. through four stoplights, making a left into McKinleyville Plaza Shopping Center ,after passing through the Heartwood Dr. intersection. Traveling South from Crescent City/Trinidad areas, take Hwy. 101 S. to Murray Rd. off ramp turning east until you reach Central Ave. Turn right on to Central Ave. from Murray Blvd. and continue to travel South on Central Ave., until you pass Hiller Rd. 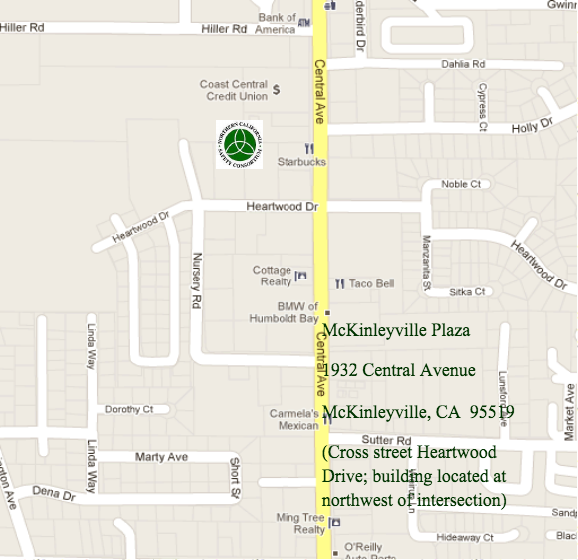 Turn right into the McKinleyville Plaza Shopping Center immediately after passing Coast Central Credit Union. Traveling from the East from Redding/Willow Creek/Blue Lake take Hwy. 299 West taking the North Bank Rd. off ramp following North Bank Rd. until you reach Hwy. 101 and Central Ave. Turn right merging onto Central Ave. continue north through four stop lights making a left once passing through the Heartwood Dr. intersection.